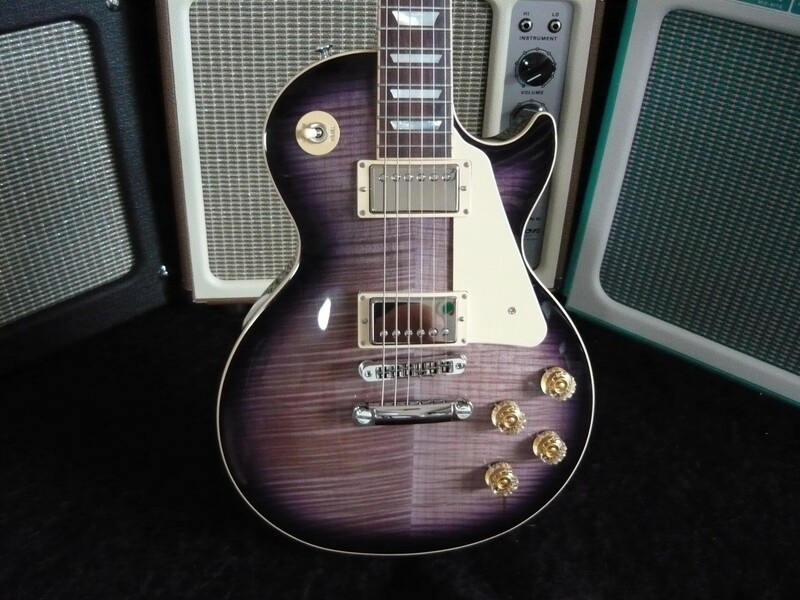 2015 GIBSON LES PAUL TRADITIONAL - Placid Purple - Brand New, not been a demo, in stock now at Guitars Rock. Traditionally, the Les Paul was a big, thick, massy guitar with a neck you could really dig into and a body that sustained for eons. This Les Paul Traditional gives you all of that, including hauntingly accurate tone, plus all of the perks that make Gibson's 2015 lineup too cool to pass up. We're talking about an unchambered mahogany body topped with figured maple, a late '50s rounded neck, and a pair of extremely cool '59 Tribute humbuckers, plus Gibson's new adjustable Zero Fret Nut, an extra-wide fingerboard, G-Force robot tuning, and more. These '59 Tribute Humbuckers give your 2015 Les Paul Traditional a decidedly warm sound, with the kind of depth and clarity you'll only get from choice Alnico II magnets. Comfort and playability were two of Gibson's primary concerns when they were designing this 2015 Les Paul Traditional solidbody electric guitar. This guitar's neck and fretboard are .050" wider on each side, making bends and vibrato much easier on its outer strings. Gibson's new patent-applied-for Zero fret nut can be easily adjusted with a hex key if your action is too high - no filing necessary. The Gibson Les Paul Traditional plays like a well-worn classic thanks to a new PLEK process and a new lower fret wire. Traditional's silky-smooth fretboard, now sanded and buffed to perfection with an all-new oil treatment, an amazingly smooth feel for faster players.